Focus Forward has teamed up with Yellow Wood Success Academy to provide you with this year long program, to overcome challenges and find success! This program begins with your student working with Yellow Wood, for Success Training, over summer. 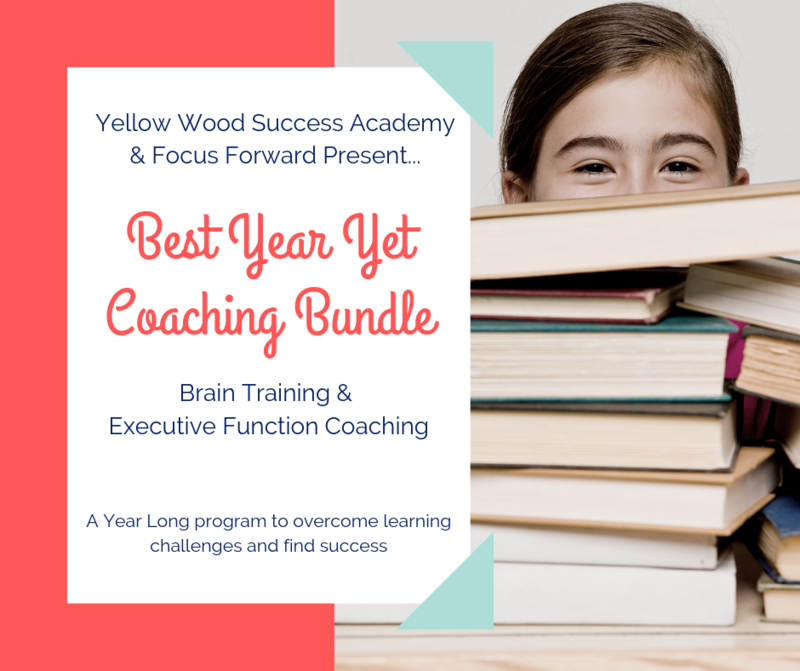 Focus Forward will then follow up your work with Yellow Wood to provide Executive Function Coaching throughout the school year. Success Training is a full customized program to strengthen brain skills through games and movement. We identify weaknesses and work to strengthen them so that students can be successful academically. Working memory, attention skills, visual and auditory processing, and other cognitive skills are strengthened. We also do reflex integration, listening therapy, and more. Executive Function Coaching is a partnership between the Coach and client. This process is not about the Coach telling the client what to do, but rather the coach empowering the client to find, and try, new paths to reach their fullest potential. You will go through the entire School year with your ‘partner in crime’, your Coach. Our goal is to help our client to feel more confident through building their Executive Function skill set; organization, planning, prioritizing, time management, attention, memory and more! Would you LOVE for your child to continue working on math and English skills this summer? Our games and movement based program will allow your child to work on and improve math, English, and other academic skills through small group learning experiences that are fun and engaging! Summer Intensive at Yellow Wood is a great way to boost skills and won’t feel like tutoring! Why choose Yellow Wood’s Summer Intensive? our unique brain training program, we call it Success Training, allows students to strengthen skills like attention, working memory, processing, comprehension, and more… all while having fun! you won’t have to worry about your student losing their academic skills over the summer - we’ll help keep them fresh! 6:1 ratio allows us to individualize your student’s experience to meet their needs! Include a pre and post screening of cognitive skills and more! Ready to enroll? Get started below! 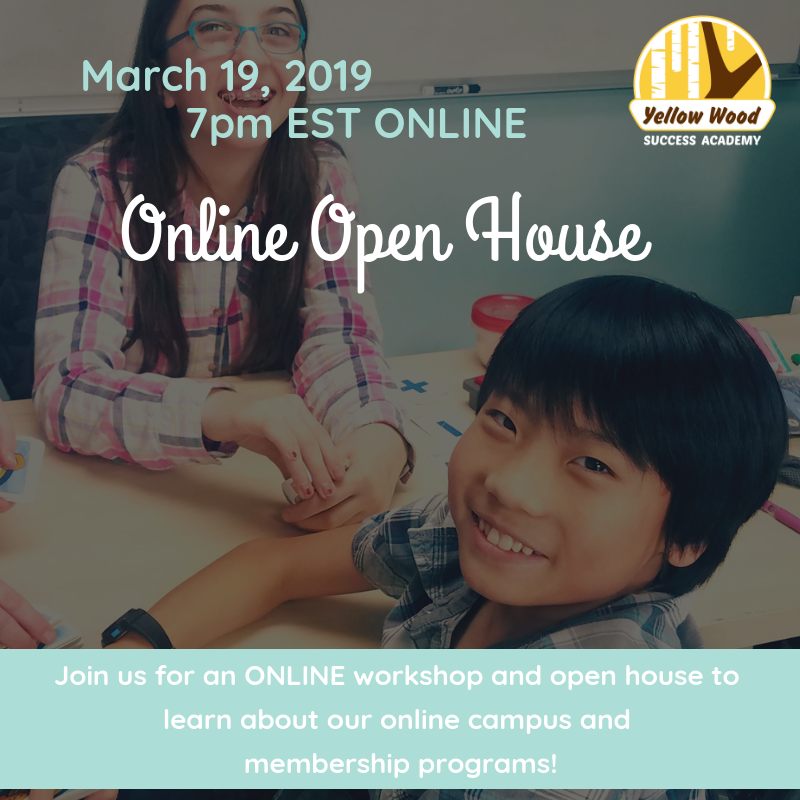 Join us for an ONLINE workshop and open house to learn about our online campus and membership programs! Parent Workshop - Homeschooling a Unique Learner? Start here! Join us in Lexington, KY for a parent workshop on successfully homeschooling with unique learning challenges! This workshop is $15 and includes actionable tools to use at home! Join us for an ONLINE summit, all about brain-based methods for homeschooling unique learners! For years we’ve dreamed of bringing together the best and brightest experts in homeschooling who have our same goal in mind - to reach students where they are and guide them toward success! Whether your student has a learning challenge, special needs, or is gifted, you’ll find inspiration and actionable tools from some fantastic people! Lecture notes, resources, and activities provided by the speakers so you’ll have a solid action plan for utilizing new ideas in your homeschool! Even better… you’ll have LIFETIME ACCESS to all the resources available, both workshops and handouts. Mark your calendars and join us February 26th-28th! Registration will begin soon! Sign up below to be the first to gain exclusive access to pre-sale pricing! Small group and one-on-one classes. A truly customized learning experience!